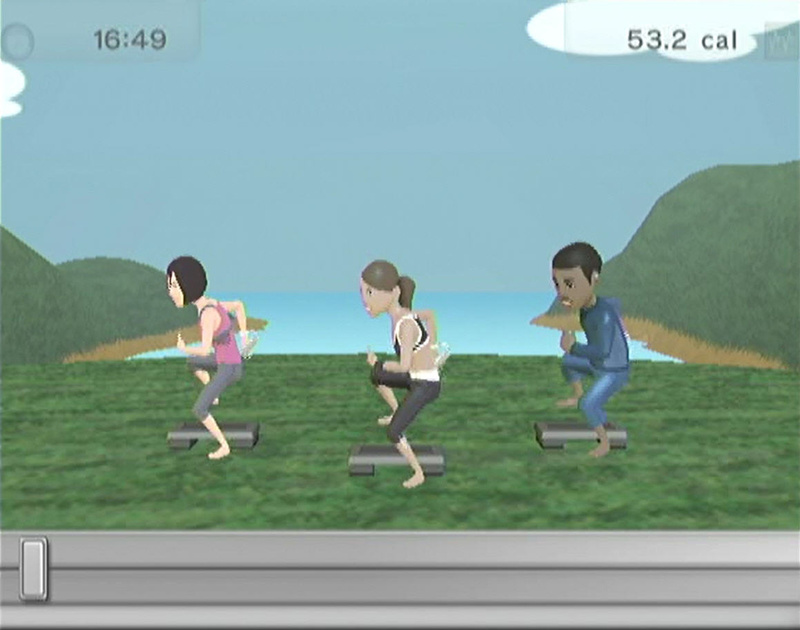 The Wii is a great console for combining a love for gaming and fitness. 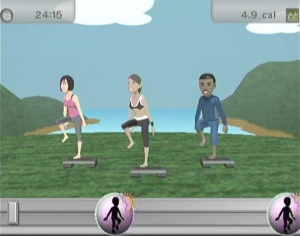 Casual workout titles like Wii Fit offer laid back activities like yoga and jogging, while third-party titles like EA Sports Active offer up more rigorous cardiovascular routines. But what about WiiWare? Sure, retail offerings are great, but Nintendo's download service hasn't really had many options in the fitness genre. Actually, aside from the platform's incredibly niche Physiofun: Pelvic Floor Training and Physiofun: Balance Training, Step Up is the only other purely fitness title available to download. So how does it stack up? Well, quite literally, it stacks up: the game is a tie-in for a riser add-on for the Balance Board that's meant to transform the board into a traditional aerobic step. If you've got a footstool or other similarly raised board, however, that will work too. For a title pitched as a Balance Board game, Step Up's use of the peripheral is incredibly inconsequential. 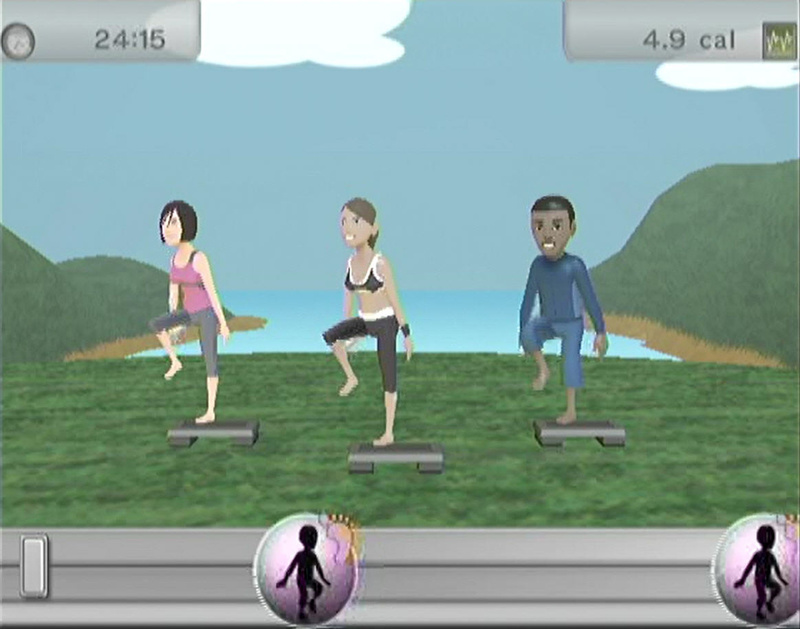 As you work out, the game counts how many calories you've burned via a clicker in the top right corner. It can't be very accurate however, because if you choose to bail and grab some water mid-session, the game keeps on counting your calories (there is no option to pause the game). Presentation is lacking at best. Graphics are lifeless and dull, and the movements of your instructors are so jagged that they can sometimes be hard to follow. 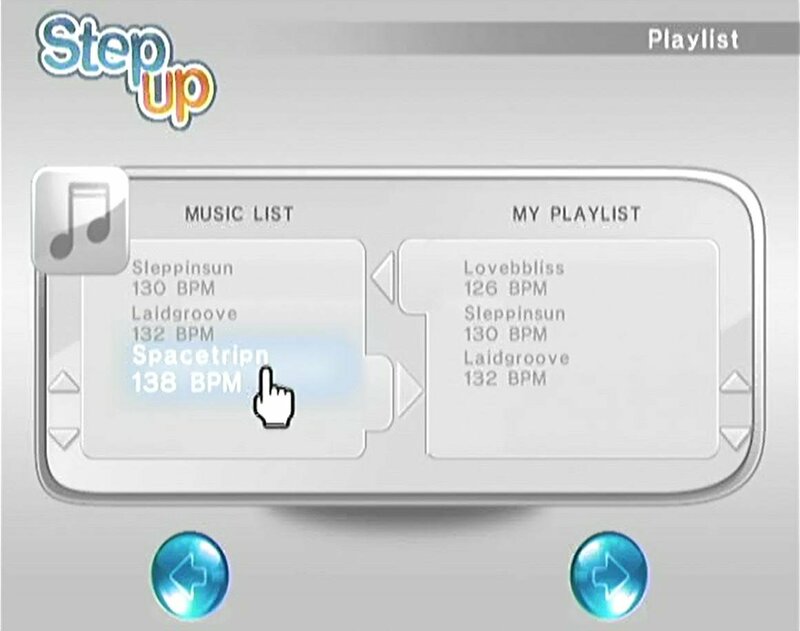 From the barren title screen – consisting solely of the words “Step Up” and a clunky blue button to press – you are taken to the main menu. Here there are four player slots, each letting you punch in your weight and gender. That's as far as the individual customisation goes however; there's a "settings" icon, but it only tests if your Balance Board is on and working. You can use the Balance Board to automatically set your weight though, rather than punching it in manually. Leaving the Balance Board off just changes the object the on-screen characters are stepping on. 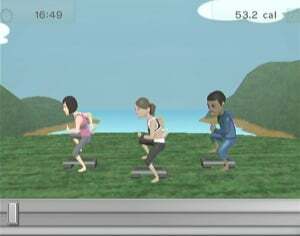 The only added functionality of using the Balance Board, aside from the aforementioned weighing, is that the on-screen characters will all be using Balance Boards. The right and left sides of their boards light up corresponding with your steps. This doesn't impact the game at all however; you can take a few steps and then go make a sandwich and the game will keep counting your calories. The overall amount of content is also quite sparse. 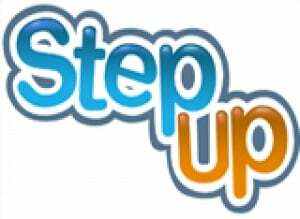 A total of 12 different step moves are mixed into seven sessions of supposedly varying difficulty. You can select to work out for either five, ten or 15 minute sessions, and can choose the tracks you want to listen along to from the game's limited selection of canned rhythms and beats. The music is OK, but far from motivational. There is the option to “customise” your routine, but when there are only a total of 12 “moves” to mix and match, the outcome doesn't feel much different from the normal routines. Your progress isn't tracked in-game at all (the game only remembers your last weigh-in) and even if you do follow the routines vigorously, there still isn't much of a workout to be had. Maybe if you shell out the extra cash for the tie-in Balance Board riser the workouts would feel more significant, but as they are you'd likely be just as invigorated going for a casually brisk walk. Basically, the game is just a promotional piece of software for a peripheral to a peripheral, containing seven simple workout routines that you can oddly play along with without the Balance Board or add-on riser. 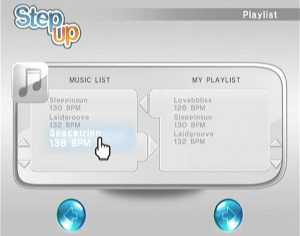 With so many other stellar workout games out there for Wii, it is impossible to recommend Step Up. The overall package is quite unpolished, the game gives you little incentive to play along correctly and a $20 add-on for the Balance Board is needed to get the most out of this already overpriced software. If you love your Wii and working out, you're better off spending your money on a full retail experience like Wii Fit Plus. Burning calories while you're just sitting there and working your way through a dozen of cheeseburgers, cokes and a pound of fries ? How can this not be the greatest, most perfect workout title ever made ? Congrats GolemLabs & Zoozen. I bet that enough people who are looking for a sports game fall for it to make it profitable. Also, where are the Miis? These kinds of titles usually call for the kind of person who really love the Miis, or so I've seen, anyway. Good point in conclusion; Wii Fit Plus is a fine piece of software, and all you need to really have a good time with a bit of exercise. wow, those look like... GBA level graphics... pathetic effort really... when is Big N gonna learn to have some flipping quality control? The word's of the AVGN what the hell was they thinking! @yoyo1212 I'd rather eat the rotton skunk than play this POS! Nah, I'd rather play Wii Fit Plus.